Mele e Pere, the recently opened Italian trattoria on Brewer Street, means “apples and pears”, which goes a long way in explaining the fanciful collection of glass apples and pears in the restaurant’s eye-catching front window. But the window is slightly deceptive as to reach the restaurant one must head downstairs to the basement. Despite this, Mele e Pere has made good use of the basement space as the dining room feels reasonably spacious. It is quirkily decorated, and the lovely contrasting tiles and wooden floors have given the trattoria a relaxed modern feel. I booked Mele e Pere on a TopTable offer of three courses and a glass of wine dinner special for only £17.50. I usually have some reservations about most TopTable dining offers, after all you get what you pay for. But the man fronting Mele e Pere is Andrea Mantovani, who was previously the head chef at Arbutus, the one-Michelin starred restaurant on Frith Street. His pedigree helped to deal away any hesitation I might have had. 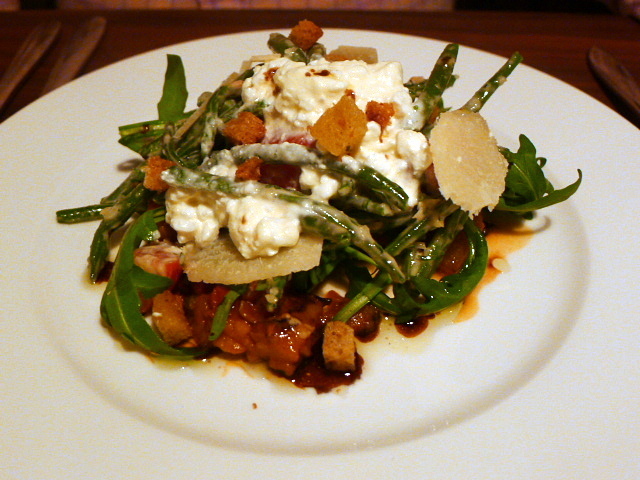 A generous starter of green bean salad with a cottage cheese dressing was delightful. The dressing was rich and creamy and oozed with garlic-y goodness. The beans were well cooked with a bite to them, and the use of crunchy croutons and nutty parmesan shavings added flavour and lots of lovely textural contrasts. 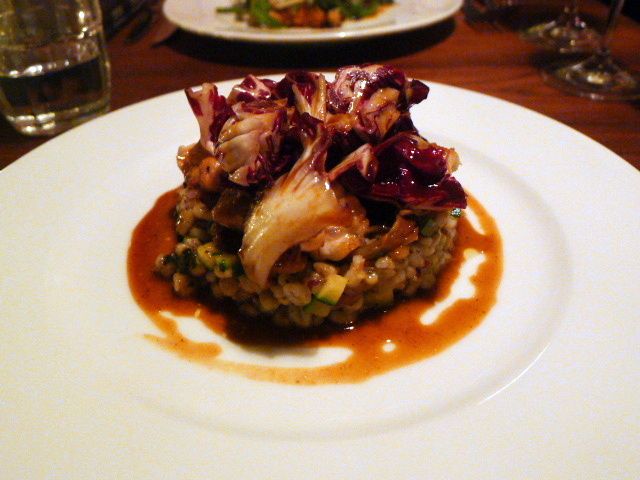 Guinea fowl with pearl barley and pomegranate was also generously sized. But there was too much barley to guinea fowl on the plate, leading to a dish that was imbalanced in terms of proportions. The bird was nicely cooked but a little under seasoned. However the sweetness of the pomegranate gave the dish a lovely zing. 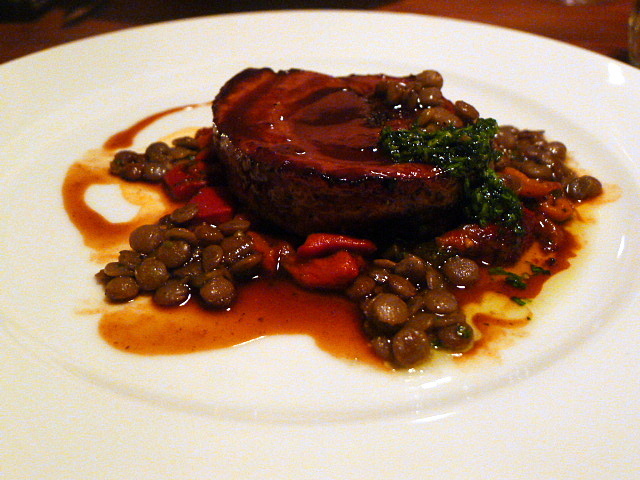 A main of roast porchetta with lentils and salsa verde was disappointing. There was a nice flavour of thyme running through it, but the pork was dry, and the roasted peppers in the salsa verde were a little bitter. But the restaurant redeemed itself with their glorious rendition of an egg maccheroncini pasta dish with San Marzano tomatoes and ricotta. 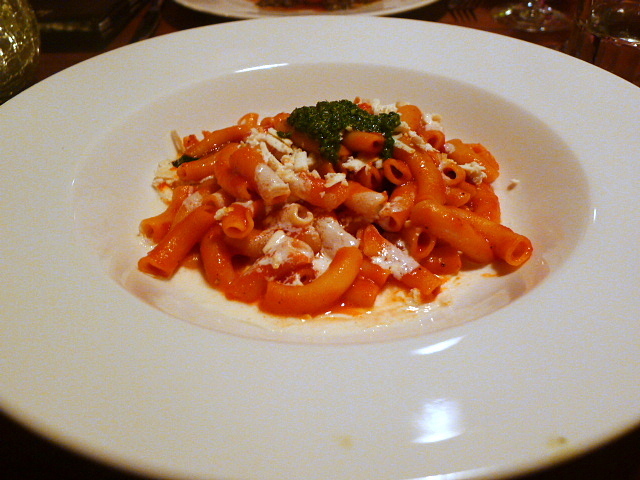 The pasta was expertly made, light and airy, and the tomato sauce was sweet and tasty. And with the ricotta running through the sauce to give it a creamy effect, the dish became something decadently delectable. 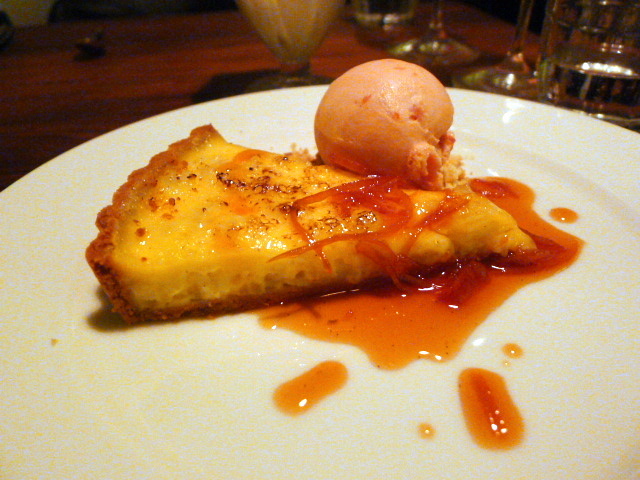 A custard and rice tart with orange sorbet was also very good. The custard was lovely and creamy, and the pastry had a good buttery crunch to it. But most impressive was the sorbet which was light, well flavoured, and which matched the tart perfectly. 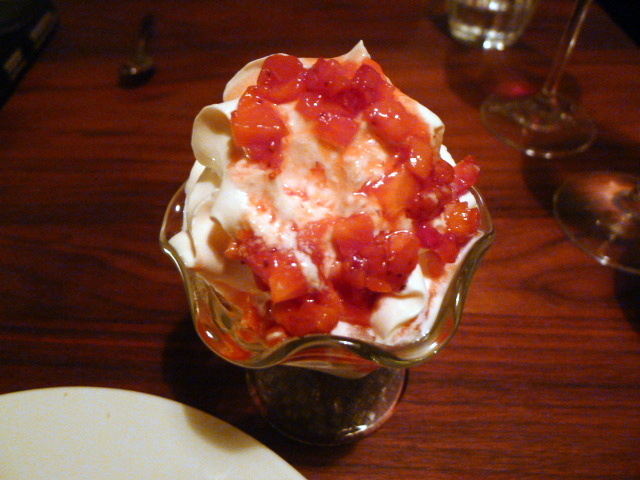 But the aspect of this meal which really blew me away was the fior di latte ice cream with strawberries. A textural dream, this was truly one of the best ice creams that I have ever tried. There was a whipped effect in the ice cream which made it incredibly light. The sweetness was well measured so that it was not too sweet. Mantovani is truly a deft hand with ice creams and sorbets. The service was efficient, professional and accommodating. When I mentioned to the head waiter that the porchetta was dry, he comped our coffees. The thing that I took away from my experience at Mele e Pere was just how good both the pasta and desserts were. I would go back to the restaurant for these two reasons alone. Less pleasing were the meats, but the bean salad was also a delight with its use of fresh, tasty produce, and a winning choice of ingredient combinations. And all said and done, what we ate, we ate for £17.50 each, with a glass of good house wine thrown in. Incredible value I say. Price range: £17 – £38 for three courses. Excludes drinks and service.